Carlos Amador is CIPC’s Organizing Director, based in Los Angeles. He brings a wide-range of organizing and campaign skills from his years as a national immigrant youth leader. He was previously the Project Manager of the Dream Resource Center at the UCLA Labor Center, where he worked on issues impacting immigrant youth nationally. He is a former Vice-Chair of the Board of Directors for the United We Dream Network, and a founding Steering Committee member of the California Immigrant Youth Justice Alliance. Carlos was also a key member of the successful national campaign that won the Deferred Action for Childhood Arrivals (DACA) program in 2012. Carlos graduated from the UCLA with a Master of Social Welfare in 2011. Carlos Amador: California Immigrant Policy Center is a statewide immigrant rights policy and advocacy organization. We’ve been around since 1996. And CIPC came around because of the federal reforms, immigration and social welfare reforms, in the 1996. Advocates and organizers decided to take action after many of these cuts were being done at the federal level, as well as criminalizing policies were being passed at the federal level as well. So, people turned to the state and started to push forward policies that benefited and advanced the rights and protections for immigrants in the state. So CIPC has been working for the past 20 years on state and local issues impacting the lives of immigrants and immigrant communities. Currently, we’re working on several fronts to continue doing, fulfilling this mission. We were one of the organizations that were key in the campaign to pass the California Values Act, also known as the State Sanctuary Law, SB 54, which was passed last year and signed by the Governor here in California. This year we’re working on implementing the law, making sure that local law enforcement is following on these protections and rights for the immigrant community. And making sure that they continue to disentangle themselves from working with the deportation machine at the federal level. So, we’re also defending the law against any attacks, both local and federal. For instance, the lawsuit coming from the Trump administration. Attorney General Jeff Sessions is putting forward this lawsuit to try to prevent from the law being implemented. We’re continuing to work to make sure that local law enforcement is implementing this new state sanctuary law, the California Values Act, to ensure that people that come in contact with law enforcement are not put in jeopardy and put at risk of being turned over to ICE. 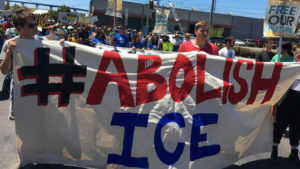 We’re also working on advancing and furthering the rights and protections that the California Values Act has put in place, to make sure that local law enforcement agencies go beyond and strengthen the protections to ensure that they are disentangling themselves from the deportation machine. BT: Do you also try to help with Healthcare for immigrants? CA: Yes, we are working and leading the efforts to ensure healthcare access for immigrants in the state, regardless of status. One of the campaigns that CIPC has been one of the leading organizations for is the Health For All Campaign launched in 2014, and every year making strides and efforts and progress to ensure that healthcare access is a right for everyone in the state. A couple of years ago, we were able to successfully get the state to approve expansion of Medi-Cal for undocumented children and youth, but we want to make sure that those rights and that benefit is applicable for everyone regardless of their age and regardless of their immigration status. So, we’ve continued to push forward the Health For All efforts. We’re also working on expanding public benefits as well as defending the public benefits that already exist for the immigrant community in the state. And keeping an eye out and preparing for any attacks on people that have been able to benefit from social services, to make sure that they’re able to stay in this country and continue to live fulfilling lives. So, we’re engaged in many efforts, whether it’s from immigrant integration, fighting detention and deportation, healthcare and public benefits efforts, as well as economic justice and workforce development for the immigrant community. 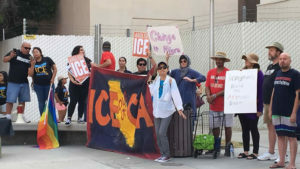 And so, I think one of the reasons why the State of California has been successful in implementing progressive pro-immigrant policies, it’s due to efforts that CIPC and many other organizations, via coalitions and via just campaigns, we’ve been able to move. BT: How filmmakers can help and support Los Angeles immigration Policy Center tasks and goals? CA: I believe that filmmakers can help in many ways to ensure that we continue to advance the rights and protections and support the lives of immigrants in this state and in the country. One of the ways that I think we can change the hearts and minds of the public is by applying and sharing the stories through a cultural lens. And through the arts and the film, we’re able to reach many other audiences that may not be reached via legislation. And so, really sharing the stories and humanizing the issue of the lives and contributions that are done by immigrants in our communities is one key factor to make sure that we are educating and changing the sentiment to a positive one for the larger society, and how we view and interact with immigrants. BT: To your experience, how effective a film can help to bring the subjects you have discussed into the light? CA: I think that there had been some great efforts to continue to humanize the stories and issues impacting the immigrant community, both on the media as well as in the film industry, especially by independent filmmakers. But I think one of the things that it would be important to lift up the stories of people that have had experience with the criminal justice system. So people that, in the past, have made mistakes and have been put in the criminal justice system. So thinking about how they have turned their lives around, how they have rehabilitated and are in the process of or have come out of the prison system to a community where they would like to have a second chance. 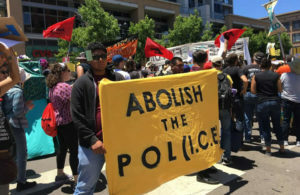 But unfortunately, given the immigration laws and immigration enforcement, are deemed disposable and are deemed as they no longer should have another opportunity. So, making sure that we lift up the stories of many immigrants that have been impacted by the criminal justice system and how they too deserve a second chance, an opportunity to live fulfilling lives in this country, in their communities, and stay with their families. And many times, the only place they know and call their home. So I think these factors are important to lift up. But I think the other issue or other stories that I think are powerful to also tell for the audience to really get to familiarize themselves more and more in an intimate level, are the stories of those that have been deported already. Oftentimes we see, whether it’s in the media or through other means, other avenues, the story of the deportation that is happening right now. We know X number of people were picked up at a raid. Or an immigration enforcement operation took place and this many number of individuals were deported. And so oftentimes we see the numbers, but we are not necessarily seeing the stories of the family members and also the stories of the deported individuals once they arrive in their country of origin. So I think that’s another important story to lift up too. What does it mean to send someone away, to send someone back to a place that they have little to no connections? Where they have to start all over on their lives there, and everything that they left behind as well? So many times, we think about a person being deported and the only thing that we see is that person essentially disappearing from our community, from the state, this country. But what happens to that person when they arrive somewhere else, once they arrive in the country of origin? I think that is also impactful for everyone to understand, to recognize and to connect in an empathic level to ensure that we remedy those issues and those injustices. I think obviously the stories that are coming out on the family separation at the border, the family detention and detention of any immigrant in immigration jails, whether they’re public or for-profit – and the majority are for-profit detention jails, immigration jails. But also thinking about often… obviously most people that are coming and turning themselves in at the borders, seeking asylum, are people that coming from Central American countries, for the most part because of the violence that is happening in their countries. But thinking about, what are the other immigrant groups that are arriving in the US, whether authorized but especially those without documentation? So, thinking of other communities that are new arrivals, whether it’s Asian or South Asian nationals and how they are integrating themselves in the society, how they are integrating themselves in the communities, and the challenges that they are facing. So, what are some of the other communities that have been impacted as well, that are living these experiences, so we also take it outside of the realm of the immigration issue being a Latinx issue. So, I think that’s another important point to elevate. And obviously we know of the contributions that immigrants do to this country, to their communities, to the economy, but how do we also break down the myths of the fact that immigrants take away from the country? So, making sure that people understand all the different contributions, not only economic but cultural, societal contributions that are being done by immigrants. I think it’s of great importance as well. Obviously, in the past, there has been many documentaries on regards to the history of immigration and immigration to this country, but I think it is important to continue to resurface the historical context to what is happening currently today in their society as well. 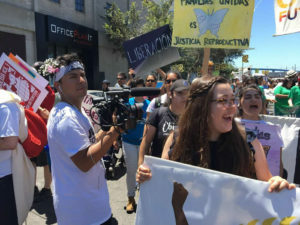 BT: Has the California Immigration Policy Center worked with filmmakers or helped them to find the right subject and approach? CA: Yes, in the past, we have worked with cultural workers. So whether it’s filmmakers or artists in many different mediums. So we’re willing to work with other artists, filmmakers to ensure that we’re able to provide whatever expertise or connections we may have in order to advance the stories and report and uplift the humanizing aspects of the immigrant community here in this country. Therefore, we would be open to collaborating with filmmakers in efforts to ensure that they capture the most authentic and meaningful stories and issues impacting the immigrant community.